What are the best rock climbing shoes? This is a simplistic answer, but the best rock climbing shoes are those that work best for you. If you’re reading this page though, you are probably a beginning climber and I can probably predict what type of shoe is best. This article walks through my favorite climbing shoe, a shoe with characteristics that I think all new climbers should be looking for. To me, the best rock climbing shoes for me have been the Evolv Royale. Why is the Evolv Royale so good? My main priorities in a rock shoe are low price, longevity, and comfort and the Royale meets all of these needs for me. If you came here asking “what are the best rock climbing shoes?”, you’re probably new to rock climbing. The Royale is a good shoe for the new climber as beginners tend to wear out shoes fast and the Royale is long-lasting. You don’t want to buy a $200 pair of climbing shoes and immediately wear holes in them. Once you become a more experienced climber your foot placement will improve and your shoes will last longer. 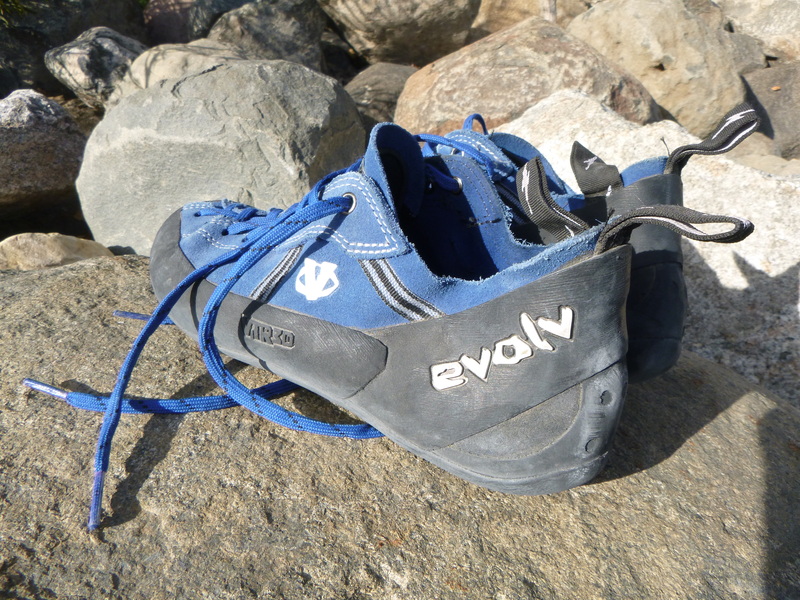 The Evolv Royale is one of the lower-priced rock climbing shoes. I paid about $80 at my local gym for mine but they are often available for less than $75 online. Check out Amazon to see how much the Royale costs. While online can be a great place for deals, be sure to try on, and if possible try out, rock climbing shoes before you buy them. The sizing for climbing shoes can be very inconsistent and most people tend to intentionally purchase shoes that are on the tight side to improve feel for the rock. The best rock climbing shoes for the beginner are comfortable. This may seem obvious but it’s not much fun to climb if your feet hurt. Many guides to purchasing rock climbing shoes recommend that you buy very tight shoes. While this is true for the expert climber, someone new to the sport should be careful to buy a shoe they can tolerate. You don’t want to spend all your climbing time thinking about how much pain your feet are in. When you are just getting started the tightness of your shoes is the last thing that is holding you back. Strength and technique are going to get you where you want to be, not painfully tight shoes. Know what else is comfortable? Not smelling horrible. Many climbing shoes are synthetic and, because you don’t wear socks with them and you sweat into them, they start smelling terrible in a short time. This stink is impossible to remove! You don’t want to have a like new pair of shoes that you can’t wear because they smell. Leather shoes go much longer before they start to smell. You may have noticed that the Royale has laces but many rock climbing shoes are tightened with velcro. Laces or velcro doesn’t matter much. Laces are great if you want to loosen up part of the shoe slightly, velcro is great if you like to take your climbing shoes off a lot. It doesn’t really matter for the beginner. Just avoid the “slipper” style with no method for tightening. These shoes aren’t great for beginners as the fit has to be precise. In fact, I don’t think I’ve ever seen anyone wearing these. If you use slippers, let us know why in the comments. Won’t a Beginner Shoe Hold Me Back? Not really. 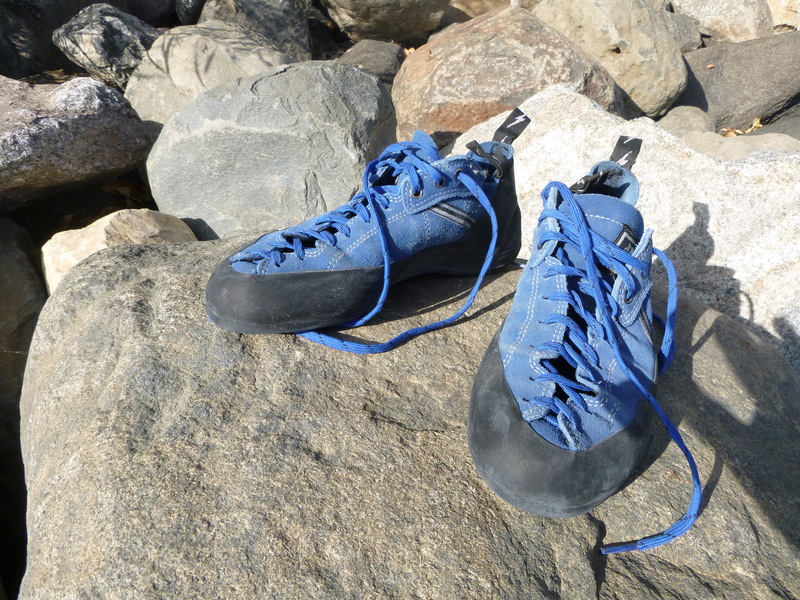 While a more aggressive shoe might be better in narrow niches (bouldering, very difficult free climbing), most climbers will do fine with an average shoe. In fact, I find I climb much better when I’m not looking forward to taking my shoes off, especially when it won’t be possible for a long time like when I’m halfway through a multipitch route.